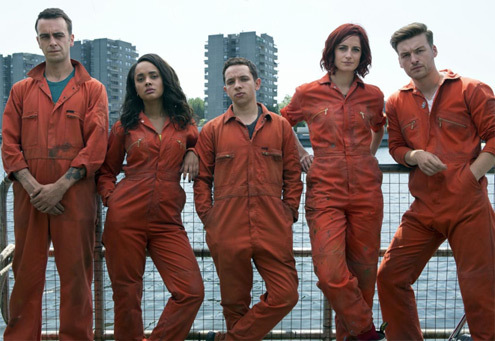 Misfits is a situation comedy about young offenders who are sent to work on a community service program. 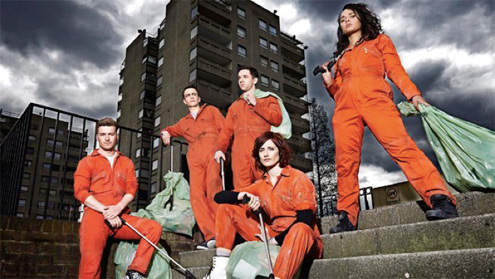 Initially sitcom conventions and stereotypes are evident: exaggerated characters, familiar locations and each character with their own storyline; however, Misfits offers a set of unique selling points (USPs). This allows the programme to deviate from convention that is one of the key audience appeals for its young, educated target audience. For example, each episode may focus on one character’s story as opposed to the collective group. Often this character is killed off, only to be replaced with another delinquent who may serve the same comedic role (see Only Fools and Horses when ‘Granddad’ was replaced by ‘Uncle’). Another USP of the show is that unlike most situation comedies, Misfits does not always follow a traditional three act structure e.g. a beginning (problem and characters introduced), the middle (main developmental action points) and the end or resolution (closure, story resolved). Instead, Misfits can have a narrative that rolls over to the next episode, a cliffhanger involving a specific character which also prevents the programme from being fully analysed using a Todorovian model of Equilibrium, Disruption, Resolution and New Equilibrium: narrative arcs underpin the whole series. This all creates an enigmatic representation that helps Misfits achieve a degree of critical success for its originality and invention.